ערן שחורי, רכז פעילות 'רוכבים לעבודה' וחבר בצוות 'מדיניות ציבורית' בעמותת 'ישראל בשביל אופניים'. This report describes methods for evaluating non-motorized transport (walking, cycling, and their variants) benefits and costs, including direct benefits to users from improved walking and cycling conditions, and various benefits to society from increased nonmotorized travel activity, reduced automobile travel, and support for more compact land use development. It identifies various types of benefits and costs, and describes methods for measuring them. It discusses non-motorized transport demand and ways to increase non-motorized travel activity. This analysis indicates that non-motorized travel provides significant benefits, many of which are overlooked or undervalued in conventional transport economic evaluation. Table 25 summarizes unit cost values used in the economic analysis. The unit costs for cars are from the Ministry of Transportations' official unit cost catalogue (Transportøkonomiske Enhedspriser). The external values for cars are reported for gasoline cars under urban off-peak conditions. 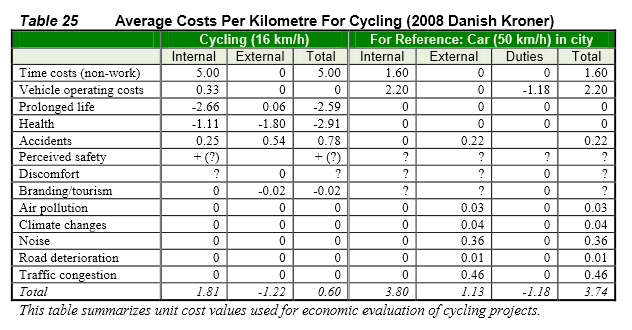 In total, cycling is estimated to have net costs (costs minus health benefits) of 0.60 Danish Kroner per kilometer. Health benefits include reduced medical and disability costs valued at 1.11 Danish Kronor (DKK) to users and 2.91 DKK to society, plus 2.59 DKK worth of increased longevity. Car travel is estimated to have net costs (costs minus duties, which are large because Denmark has very high fuel taxes) of 3.74 Danish Kronerper kilometer. This would be even higher under urban-peak conditions due to higher congestion costs. Bike facilities improve cycling conditions for many riders. A 2009 study by researcher Jennifer Dill used GPS technology to collect information on bicycling behavior from 166 regular Portland riders. It found that a “disproportionate share of the bicycling occurred on streets with bicycle lanes, separate paths, or bicycle boulevards” and concluded that “the data support the need for well-connected neighborhood streets and a network of bicycle-specific infrastructure to encourage more bicycling among adults. A 2006 Minneapolis study shows that 83 percent of the time cyclists will choose a longer route if it includes a bike lane, and respondents were willing to add 20 minutes onto their trip in order to use a bicycle trail instead of riding on roads with facilities next to parked cars. In urban areas, where cars and bicyclists travel at similar speeds, bike lanes can accommodate 7 to 12 times as many people per meter of lane per hour than car lanes and bicycles cause less wear on the pavement. The cost of a bike lane varies depending on the location, the condition of the pavement, lane-painting expenses, changing traffic-light signalization, and other factors, but can cost as little as $5,000 a mile. It is most cost-effective to create a bike lane when an existing road is being repaired or a new road is put in. California is on the expensive end of the spectrum. Using state-wide averages and local cost history, the city of Roseville, Calif. estimates the cost of signage and striping for a mile of a standard bike lane in California to be $60,000. In contrast, the California Department of Transportation (CalTrans) is paying $75 million to repave, not rebuild, just three miles of Interstate 710 in Los Angeles. Thus, for the cost of repaving 3 miles of rough pavement on Interstate 710, CalTrans could sign and stripe 1,250 miles of California roads for bike lanes. That’s more than the distance from Los Angeles to Seattle, Wash. Critics sometimes express concern that eliminating on-street parking to make room for a bike lane would harm local business. However, many business districts are discovering that attracting customers requires more than plentiful parking. Along San Francisco’s Valencia Street, two-thirds of merchants surveyed four-and-a-half years after bike lanes were painted said that the lanes had a positive overall impact on their business. Two-thirds of the merchants also supported more traffic calming measures on the street and all of the merchants said they could be supportive depending on the project. Businesses can also benefit from the health impacts of their employees bicycling to work. A study of 30,604 people in Copenhagen showed that people who commuted to work by bike had 40 percent lower risk of dying over the course of the study period than those who didn’t and bike commuters average a day fewer absences due to illness each year than non-bike commuters. In recognition of these economic advantages and in an effort to attract and retain highly sought-after employees, employers are continuing to add wellness and health management programs to encourage healthy habits among employees. Many communities have recognized the broad appeal of bicycle facilities and the impact they can have on real estate values. Arlington County, Va., a silver-rated Bicycle Friendly Community, has set the goal of ensuring that all residents live within a quarter-mile of a bike facility and has currently achieved 90 percent coverage. Realtors sell not just houses, but communities, and that increasing transportation choice increases livability. By mapping real estate transactions, researchers have been able to show that bike facilities can have positive, statistically significant impacts on home values. The design identifies the value placed on home proximity to urban bicycle greenways with a statistical formula that controls for other housing features. A study of home values near the Monon Trail in Indianapolis, Ind. measured the impact of the trail on property values. Given two identical houses, with the same number of square feet, bathrooms, bedrooms, and comparable garages and porches – one within a half mile of the Monon Trail and another further away – the home closer to the Monon Trail would sell for an average of 11 percent more. More studies on the impacts of trails and paths can be found at the National Trail Training Partnership and the Rails to Trails Conservancy. Employers who provide free parking to their employees are actually subsidizing the cost of their employees’ transportation with a significant, often unrecognized and untaxed, benefit. Whereas bicycle parking can often be provided in otherwise unused space, car parking adds a significant cost to office real estate. Even without accounting for the cost of land, building parking comes at a significant cost. A simple surface level, paved parking space costs between $3,000 and $5,000, depending on drainage and landscaping. A single space in a parking deck costs $10,000 to $50,000. Employers are bearing the cost of these spaces in their rent or purchase price. In addition to costs related to driving, there are also considerable costs due to physical inactivity that can be reduced by promoting bicycling. The health benefits of physical activity have long been established and researchers from a range of disciplines have been able to show that the physical environment impacts levels of physical activity. There are many different ways to estimate the health cost savings of bicycling. The values vary depending on study design, medical conditions attributed to inactivity, cost data availability, and other variables, but all studies show positive outcomes. The health savings resulting from physical activity, measured in 10 different studies, range up to $1,175 per person, per year. The median annual per capita value of the ten studies was $128. Drawing on some of this research, the Robert Wood Johnson Foundation’s Active Leadership Program has developed an online tool, found at http://www.ecu.edu/picostcalc/ to determine the annual health savings that could be derived from reducing physical inactivity rates in particular communities. Users can enter information on their congressional district, municipality, or business to see how much could be saved. These savings justify spending on bicycle facilities. A 2009 study in England found that, because of health improvements, congestion reduction, and environmental benefits, a small number of additional regular riders are needed to pay for new cycling infrastructure. For example, the study’s Cycling Planning Model suggests that an investment of £10,000 – $16,521 U.S. – requires just one additional cyclist riding three times a week over the thirty year life of the project. With the proper investments, it is possible to increase the share of bicycling trips and lead to the economic benefits described above. Countries such as the Netherlands, Denmark and Germany, where bicycling levels were decreasing as car-use exploded in 1950s and 1960s, were able to reverse the trend with land-use policies and investments in separate cycling facilities in high traffic areas and traffic calming measures in residential areas. Cities in the U.S., like Portland, Ore., have been able to increase their mode-share by building a complete network of facilities and encouraging urban density. The results of a study of 33 large U.S. cities, (excluding New York City, which is considered an outlier in much transportation research because of its size and high use of public transportation) showed that each additional mile of bicycle lane is associated with an approximate one-percent increase in the share of bike-to-work trips. A modest mode shift from driving to riding has considerable impacts in savings on health, road construction, congestion, and environmental remediation. As examples in the U.S. and internationally demonstrate, this shift is possible – but unlikely without federal, state, and local investments in bicycle facilities to provide drivers with an appealing, safe alternative choice. A new research paper published last month in the Journal of Physical Activity and Health focused on how Portland's investments in bikeways relate to savings in health care costs, fuel purchase savings, and other benefits. The paper (PDF here) sought to monetize the return on investment garnered by the City of Portland for money spent on bikeway miles in the past and what potential returns might be based on projections of future spending. "By 2040, investments in the range of $138 to $605 million will result in health care cost savings of $388 to $594 million, fuel savings of $143 to $218 million, and savings in value of statistical lives of $7 to $12 billion." The paper is authored by Thomas Gotschi, a researcher with the Institute of Social and Preventive Medicine at the University of Zurich in Switzerland. "Benefits of bicycling—such as the gain in physical activity and emission-free transportation—are generally understood, at least in broad, qualitative terms, and undisputed. Nonetheless, spending money on bicycle infrastructure is often a low priority compared with investments in roads, public transportation, and other government expenditure. Although traditionally debated within the framework of transportation policies, more recently the idea of considering investments in walking and bicycling as a measure of disease prevention has gained traction... A better understanding of the cost-benefit relationships of bicycling investments would be helpful to justify such initiatives." Gotschi's findings confirm what we already know — that the miniscule investment we have made (and plan to make) in bikeways provides an excellent value for our transportation dollar; particularly in terms of reduced health care costs and fuel savings. For some perspective, Portland estimates that all the bikeway infrastructure we have built to date has cost us about $65 million. To analyze the return on investment, Gotschi used the three levels of investment outlined in the 2030 Bike Plan (see Table 1 in his paper). His findings show that at two of the three levels (the "basic" and "80%"), Portland would break even on their bikeway investments by 2015. In his conclusion, Gotschi notes that this is the first study of its kind and that Portland's investments in bikeways, "are cost-effective, even when only a limited selection of benefits is considered." Our first report, ‘Valuing the Benefits of Cycling’, placed for the first time an economic value on each additional cyclist in England. We worked with specialist economic consultancy SQW to identify the savings that would accrue from improvements in health and reductions in congestion and pollution that could be quantified in monetary terms. The economic modelling identified that the benefits of more people cycling are both significant and quantifiable: a 20 per cent increase in cycling by 2012 would release a cumulative saving of £500m by 2015, and an increase of 50 per cent would create total savings of more than £1.3bn. The research helped us make a strong case to the government for more investment in cycling and in recognition, across government, of the contribution cycling can make to health and the environment. And due to the positive progress made in 2008, Cycling England was awarded a budget of £140m until 2011. Top-level political support is one thing; getting things right on the ground is quite another. Our second report therefore sought to make the case for a fundamental rethink in the way local authorities plan cycling. The ‘Planning for Cycling’ report, also carried out with SQW, demonstrates that new cycling infrastructure pays for itself when designed and planned properly, and shows how local authority planners can apply conventional cost benefit modelling to ensure a better return on investment for every pound spent on cycling. The report makes the first economic case for cycling to be an automatic consideration as part of the planning process; by valuing the benefits of attracting additional cyclists, planners can raise the profile of cycling in the planning process. Until now, the lack of information like this has meant that the benefits of cyclists are too often ignored in transport planning. Our hope is that the CPM will help give local authorities a clearer sense of the return on investment build cycling can deliver and will allow planners to adopt the same rigour in evaluating cycling projects as they apply when considering other forms of transport investment. The Danish National Board of Health estimates that 30-40% of adult Danes are inactive. Almost 4,500 deaths, 100,000 hospital admissions and 3.1 million working days are lost annually through illnesses related to physical inactivity. Danish research shows that cyclists have 30% less risk of dying too early compared to those who do not cycle. The greatest positive health effect is seen when inactive people become active at least ½ hour per day. We know that the majority of all short trips are by car – for which reason short bicycle trips are an obvious possibility. On this background we see a great potential for public health in making it more attractive for Danes to choose the bicycle for local trips of less than 5 kilometres. From 1999 to 2002, the City of Odense chose to carry out a targeted effort to promote cycling, which resulted in the cycling traffic increasing by 20%. More than half of the new bicycle trips in Odense replaced the use of cars, which also led to less congestion on the roads for the other car drivers. Odense found health savings of approx. 33 million DKK, which more than offset the total costs of the effort of 20 million DKK6. Economic analysis from the United Kingdom shows that, such investments results in health gains worth 2-7 times the invested amount, whereas similar calculations from Norway show a gain of at least a factor of 3. England: An unprecedented investment in cycling has improved the public’s health in six Cycling Demonstration Towns – and has had a positive impact on its most inactive citizens according to new statistics published today. More people get on their bikes thanks to investment in cycling. The new analysis of research conducted in partnership with the National Obesity Observatory and Sustrans, shows the impact an increase in cycling has had on public health - with a 10 per cent reduction in the number of people classified as physically inactive. the towns have achieved growth rates for cycling similar to the most cycle-friendly European cities, and matched the growth seen in London. The six towns received support similar to that in European cities where cycling is popular and cycling schemes are successful. "It is really encouraging to see the positive effect that cycling towns are having on people's health across the whole community. The Government's cycling towns programme has shown that, by making the environment safer and more supportive for cycling we can improve public health and make exercise a part of our daily lives." The health benefits of getting the most sedentary people to take moderate amounts of physical activity are widely recognised. Physically inactive people are putting themselves at increased risk of early death. By becoming active, this risk is dramatically reduced. The benefits of the Cycling Demonstration Towns programme have been shown to outweigh the costs by at least three to one, with health benefits making up the largest part of this gain. The reduction in mortality alone is estimated to be worth £45 million over ten years. Increases in cycling in the selected towns were not seen in matched ‘control’ towns where there was no investment in cycling. The Cycling England programme is continuing to fund these towns and has since committed to investing in a further 12 cities and towns. Overall, FHWA reported a 3% reduction in vehicle miles traveled on the types of roads analyzed in this Scorecard in the U.S, during 2008. Overall, the nation’s peak period time Travel Time Index (TTI) for 2008 was 1.09. This means that during peak driving times a random traveler on a random trip on the roads analyzed took 9% extra time, on average, than if there was no congestion. When considering the change in congestion – which is the extra amount the Travel Time Index is above 1.00 (a Travel Time Index of 1.00 would define an instance when no congestion existed and a trip was taken entirely in free flow conditions) – the decrease is even more startling: peak hour congestion on the major roads in urban America decreased nearly 30% in 2008 versus 2007. As expected, the health of the economy and higher average fuel costs led to decreased congestion – but the scale of the decrease, roughly 30%, is startling. When a road network is at capacity, adding or subtracting even a single vehicle has disproportionate effects for the network. This phenomenon has been well known for a long time, but this data illustrates it in real-world terms on a nationwide basis. Bicycle access, Haladay said, lets a Portland employer play to its location's strengths. In this labor market, he's concluded, "any company that doesn't include it in its fabric of company culture is making a mistake." Portland employers also said bicycle commuting, like any employee wellness effort, tends to boost productivity – "employees that are in better physical spirits are going to be in better mental spirits," as Haladay put it. Others noted that documenting physical activity among employees can sometimes slow the growth of health-care premiums. But more than anything, most agreed, the benefit of a bike-friendly worksite is simply that these days, valuable workers seem to prefer it. "The development team here has a good set of skills that not only we're seeking, but a good percentage of the software companies in the city are seeking," said Jason Burg, a senior copywriter at Coaxis. "There has to be an edge when you're hiring." New Chicago Transportation Commissioner Gabe Klein is also on board. “We’re trying to make it easier for people to make their way into the downtown corridor without driving,” he said. transport externalities are the costs (negative externalities) or benefits (positive externalities) which aren’t reflected in your transport bill. A combination of all main externalities of passenger cars costs society between 0.05 and 0.06 euro per passenger-kilometre. This mean that external costs of car use totals at least €240 billion annually in the EU-27. The flipside of the coin; cycling. With health benefits estimated between 0.30 euro and 1,19 euro per kilometre, cycling is worth up to €119 billion in annual savings. 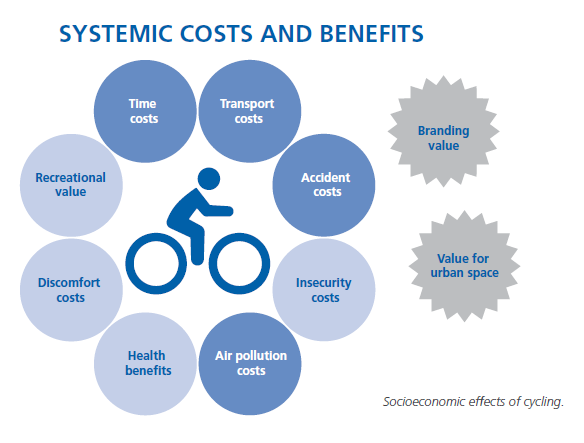 Double cycling and you would generate €238 billion in health benefits, almost as much as the total external costs of car use. Therefore, if we want a fair and efficient transport regime, then we must make sure those that pollute pay their fair share, and also reward those (yes, I mean you cyclists) who bring so much economic value to society. How achieve internalisation of external health benefits of cycling? Tax incentives, rebates and bike to work schemes could be a good start (you can see some national examples here). But the biggest first step is recognising the economic value of cycling by increasing levels of physical activity. between modes which are in direct competition. A roadway can carry 7 to 12 times as many people per metre of lane per hour by bicycle compared to by automobile at similar speeds in urban areas. Even when compared to higher-speed motorways, bicycles are twice as efficient as cars, based on the number of commuters that can be accommodated per hour for each metre width of roadway. Paths for pedestrians are even more efficient, handling 20 times the volume per hour than roads for cars in mixed traffic. Source: The Business Case For Active Transportation (page 16). עלות זיהום האוויר מכלי רכב, הגורמים למרבית זיהום האוויר בארץ, עלולה להגיע ליותר מ-50 מיליארד שקל בשנה. כך מעריכים כלכלני משרד האוצר בדוח רשמי - הראשון שמפרסמת המדינה בעניין זה - שגובש באחרונה. מדובר בחישוב הכולל נזק שנגרם כתוצאה ממחלות אותן גורם זיהום האוויר, עלות הטיפול בהן, אובדן ימי עבודה בעקבות כך ונזק לרכוש וגידולים חקלאיים. לכן מגבש השר להגנת הסביבה, גדעון עזרא, תכנית לצמצום זיהום האוויר מכלי רכב שתוגש כהצעת חוק לממשלה. בתכנית זו יציע השר לקבל את רעיון הורדת כלי רכב ישנים מהכביש תמורת תשלום לבעל הרכב. לפי הנתונים, רק בגוש דן מתים בכל שנה כ-600 בני אדם מזיהום אוויר. למרות זאת, מקבל המשרד להגנת הסביבה את אחד התקציבים הנמוכים בין משרדי הממשלה, בזמן שמדינות אחרות מעניקים למשרדים דומים תקציבים נדיבים בהרבה. מסתבר כי בעולם הבינו זה מכבר כי זיהום האוויר הוא צרה בריאותית וכלכלית, שיש להילחם בה ברצינות. בעקבות דוח מבקר המדינה ודיון בוועדת שרים לענייני ביקורת המדינה, מגבש כעת השר להגנת הסביבה, גדעון עזרא, תוכנית לאומית לצמצום זיהום האוויר מכלי רכב שתוגש לממשלה כהצעת חוק. הצעת החוק הועברה לאחרונה לעיון חלק ממשרדי הממשלה, ואחר כך תובא בפני הממשלה. שר התשתיות, בנימין בן-אליעזר בירך את השר עזרא על יוזמתו לטיפול מקיף בבעיה. הוא הציע לצרף אליה כמה הצעות מתוכנית לצמצום השימוש בדלק שחוברה על-ידי עומר סלע, כלכלן בכיר במינהל הדלק במשרדו. מטיוטת הצעת החוק שתוגש לממשלה עולה כי העלות החיצונית לכלכלת המדינה, מזיהום אוויר הנפלט מכלי רכב, נאמדת בין %‭0.66‬ ל-%‭9.24‬ מתוצר המדינה. אם לוקחים בחשבון כי התוצר המקומי הגולמי בישראל עמד השנה על 570 מיליארד שקל, ניתן לחשב כי גם הרף הנמוך ביותר, מעמיד את ההוצאה על טיפול בזיהום אוויר בסכום עצום של ‭3.76‬ מיליארד שקל בשנה. הרף הגבוה מציג מספר מבהיל בהרבה - כ-‭52.7‬ מיליארד שקל בשנה. עלויות אלה, כך מניחים במשרד להגנת הסביבה, ניתנים לצמצום באמצעות מלחמה בזיהום אוויר. דוח הוועדה הבין משרדית ל"מיסוי ירוק" באתר משרד האוצר. מסמך pdf. על פי הדוח, ציטוט: "ייתכן וההשקעה בתשתית לאופניים צריכה להיות מוגבלת על רקע מגבלות השטח העירוני, מכיוון שהשימוש בהם מתמקד בעיקר בתרבות הפנאי ופחות בהגעה לעבודה" (עמוד 11, הערת שוליים מס' 12). "מהפכת המיסוי הירוק יוצאת לדרך – רותמים את הכלכלה לטובת הגנת הסביבה"
שר האוצר, ד"ר יובל שטייניץ, והשר להגנת הסביבה, גלעד ארדן, הודיעו הבוקר על מדיניות הממשלה החדשה שעיקרה יצירת תמריצים כלכליים להפחתת הזיהום הסביבתי. לראשונה, נרתמת מערכת המס לצמצום זיהום האוויר תוך יצירת מדיניות ממשלתית ברורה וארוכת טווח - המיישרת קו ואף למעלה מזה, עם מדינות רבות בעולם המערבי. השרים אימצו את המלצות הועדה הבין משרדית, בראשות סמנכ"ל רשות המיסים, בועז סופר, וכללה את נציגי משרדי האוצר, הגנת הסביבה, התחבורה והתשתיות הלאומיות. תכלית המלצות הועדה הינה שימוש בתמריצי מס למען הגנת הסביבה - הפחתת פליטות המזהמים מכלי רכב ומפעלי תעשיה מחד, תוך עידוד צריכה ושימוש באנרגיה חלופית מאידך.